Low showing off the model of Damansara Foresta, a high-rise condominium project in Bandar Sri Damansara. KUALA LUMPUR: Land & General Bhd (L&G) is looking to expand its landbank in prime locations, said managing director Low Gay Teck. “We are looking to acquire more land in prime locations in the Klang Valley, Johor and Selangor. We are also trying to venture north to Penang as the property prices at these places are good,” he said at a briefing on its high-rise condominium project, Damansara Foresta in Bandar Sri Damansara. However, he did not reveal the size of its current landbank. He noted that sourcing for ideal land was not an easy task and was a challenge for the company. Low said it was currently busy developing Damansara Foresta and Elements@Ampang (a luxury condominium project in Ampang). Both projects have a gross development value (GDV) of RM700mil each. “We are also planning for a mixed residential development on 220 acres of land in Seremban. “Based on our initial estimate, the project has a GDV of about RM550mil,” he said, adding that L&G had kick-started all relevant pre-development for the Seremban project, but actual work might only commence at the end of this year. Low said the question of a property bubble was “relative”. “It happened because of all the hype from certain projects when the prices have gone too high. We're not selling very speculative property projects,” he said. Commenting on its project, Damansara Foresta, Low said it was a freehold residential property located next to the Bukit Lanjan forest reserve. “The overall project site consists of 42 acres, whereby only 21 acres will be developed for residential developments, leaving the remaining as natural forest,” he said. Low said L&G would be taking registration for the third block of its Damansara Foresta project in February. “We have sold part of the phase 1. Phase 1 consists of four blocks ranging from 227 to 237 units for each block. Each unit ranges from 1,400 sq ft to 1,600 sq ft to a luxurious penthouse of above 3,000 sq ft. The selling price for phase 1 ranges from RM500 to RM600 per sq ft with a maintenance fee of 25 sen per sq ft.
Low said the property was designed with lots of natural activities such as jungle trekking, resting pavilions, hammock garden, camping sites and others to make use of the forest area incorporated in the development. “We have put up all the necessary precautions, including slope protection measures at Damansara Foresta,” he said when asked as the property was located on a highland, some 180 metres above sea level. Damansara Foresta is expected to be completed by end-2015. The company will launch Platinum Park residences, residential component in Taman Tun Dr Ismail and one residential component in KL Metropolis. 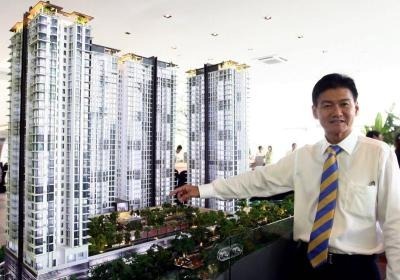 KUALA LUMPUR: Naza TTDI Sdn Bhd, which is optimistic about the property market in Kuala Lumpur, will continue to launch new projects and residential components in its existing projects. The property development arm of the Naza Group is also launching three high-end residential projects. Deputy executive chairman and group managing director SM Faliq SM Nasimuddin said the company is still optimistic about the property market in Kuala Lumpur. "So far, I think we are still going aggressive into 2012, we still continue launching our remaining phases in our current township projects and also our ongoing projects," he told a news conference after the awards ceremony for "Bertam Master Plan & Creative Ideas Competition" last night. SM Faliq said the company will launch Platinum Park residences, residential component in Taman Tun Dr Ismail and one residential component in KL Metropolis. The combined gross development value for these projects is about RM1.5 billion. Earlier, Naza TTDI and Persatuan Arkitek Malaysia (PAM) awarded six participants of the jointly-organised competition. The competition required participants to submit creative ideas and designs for the masterplan of Naza TTDI's upcoming 333.6ha township in Bertam, Penang. SM Faliq said the Bertam project is the company's first township development outside the Klang Valley. "The success of our Bertam township development will serve as a platform for us to foray into development in other parts of the country," he said. SM Faliq said the competition, which is its third such collaboration with PAM, aims to provide a platform for the architectural fraternity to showcase their expertise. He added that Naza TTDI is committed to supporting and giving due recognition to local architect firms for their creative and innovative designs. 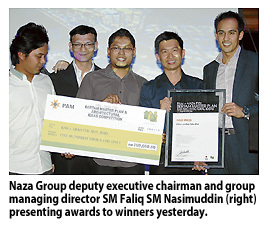 Naza TTDI had previously collaborated with PAM for respective masterplan competitions for the former's land in Puchong and Shah Alam in 2010. Among the judging criteria for the competition include innovativeness, environmental-friendly features, the ability to achieve the Green Building Index rating, economical and resource efficiency, world-class qualities and consideration of traffic circulation while conforming to local planning standards and guidelines. Also present at the awards ceremony were PAM president Ar Saifuddin Ahmad and chief executive officer Ar Paul Lai Chu. KUALA LUMPUR: Naza TTDI Sdn Bhd will commence works on its first out-of-Klang Valley project in Bertam, Penang next year. While the mixed development is still in its design stage, it will be Naza TTDI's long-term project geared towards the middle to high-end market. Deputy executive chairman and group managing director SM Faliq SM Nasimuddin said the gross development value had not been determined but gave a rough estimate of houses priced from RM600,000. The 834-acre Bertam township will be mainly residential with commercial and education developments. “Penang island is not getting any cheaper so people who want to stay there would have to look for alternatives,” Faliq said after the Bertam Master Plan & Creative Ideas Competition awards ceremony. He said that Naza TTDI had plans to go south to the Iskandar Malaysia region as well as beyond the country. While the property arm of Naza has been developing projects single-handedly, it is open collaborations and partnerships. “There are local and foreign parties that have approached us but nothing is solid yet, we are still in talks,” Faliq said. Faliq was referring to the Platinum Park, KL Metropolis and Taman Tun Dr Ismail residential projects in Kuala Lumpur. The combined GDV for these projects is RM1.5bil. Naza TTDI has a total of 1,200 acres of landbank now, 800 acres of which are under planning. The Bertam Master Plan competition was jointly-organised by Persatuan Arkitek Malaysia and Naza TTDI, where participants submitted ideas and designs for the master plan of the township. Winners of the competition were architects Lim Siew Bok, David Teh Teik Lim and Almaz Salma Abdul Rahim who received RM100,000, RM75,000 and RM50,000 respectively. KULAIJAYA: IOI Corp Bhd does not see any effect from the additional 10% stamp duty ruling imposed by the Singapore government on foreigners buying private property on its new project there. IOI Properties Bhd senior general manager Simon Heng said the company was targeting Singaporean buyers instead of foreigners for its Clementi condominium project. He said its strategic location within the mature housing estate of Clementi and close proximity with the National University Hospital and Clementi MRT station were the project's strong selling points. “There are many Singaporeans living in the HDB flats who wanted to upgrade to living in private condominiums,” Heng told StarBiz after signing an agreement service with Telekom Malaysia Bhd to provide UniFi high-speed broadband network connectivity to house buyers of Parcels 3A and 4A of Bandar Putra here and Parcel 3A of Taman Kempas Utama in Johor Baru. Singapore had in December introduced a new ruling where foreigners have to pay an additional 10% stamp duty when buying a private home in the republic, effectively raising the purchase price by 10%. The move is seen to cool the private residential prices on the island state which are on the upward trend and there are complaints from Singaporeans that rich foreigners have push up demand and prices of private residential properties. “We have yet to come out with the development details and land utilisation of 0.97ha site of the Clementi project,” said Heng adding transaction for high-end condominium in Clementi area could fetch S$1,000 per sq ft.